Apparently, producers and editors of the leftstream TV channels lost ability to distinguish fiction from reality. Such TV genres as reality shows, environmentalist propaganda, and the liberal drivel in general blend reality and fiction in various ways. Combined with echoes of academic postmodern contructivist theories, this leads to the current post-truth reporting. Alternatively, the leftstream TV expresses contempt to its viewers. 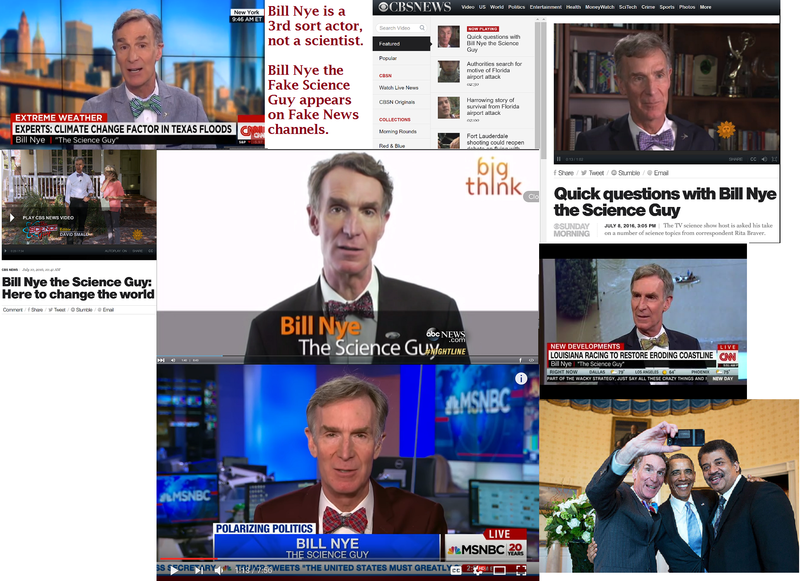 Whatever the cause, the fictional character “Bill Nye the Science Guy” has been presented as a real scientist on ABC, CBS, MSNBC, and CNN. If you watch news on any of these channels, these might be fake news. New York Times has called this actor “the science guy” as well. Bill Nye receive BS in mechanical engineering in 1977 and worked as an engineer for some years after that. By 1993 his engineering gig was over. He has been an actor and a “TV personality” for the last 20 – 25 years. He can be called a former engineer, if it helps. Sources: 1, 2, 3, 4, 5, 6. Selfie of Bill Nye with Obama is from The Federalist.